Ski Michigan is what many people do in the winter Wonderland State of Michigan. Michigan is a winter ski haven for the individuals who participate in outdoor activities such as snow skiing in Michigan. This year hopes to be a great year for the many outdoor enthusiasts who participate in the many outdoor sports especially downhill skiing and Nordic Cross Country skiing. Get outdoors and enjoy the fine Michigan ski resorts in the Winter Wonderland State! Boyne Mountain, Boyne Highlands, Nubs Nob, and Crystal Mountain are just a few of the quality ski resorts in Michigan. All have modern snow making equipment should the weather not cooperate. 28� F. is the "magic number" for snowmaking. When the temperatures drop below this mark, you can be sure Michigan ski areas are making snow. 10 inches of natural snow, when packed, usually adds only one inch of snow to the ski slope�s base while 10 inches of man-made snow adds seven inches of base. 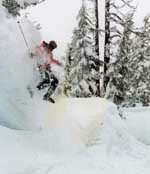 Man-made snow is more dense and durable. Four to five times as much snow can be made when temperatures are in the low 20�s than when it is 28�. Humidity is a factor as well. The lower the humidity, the better for making snow. If you add the temperature plus the humidity, that sum should equal less than 100 for favorable snowmaking weather. Ski Michigan is what many people will be doing this year. Get out to the Michigan ski resorts and enjoy the same. Who has the best Ski Resort in the State of Michigan?